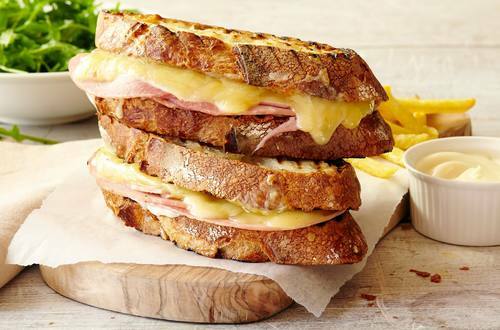 Classic Croque Monsieur French sandwich. Ham, Gruyere cheese and creamy Hellmann's® or Best Foods® Real Mayonnaise are stuffed between two slices of hot buttery toast. 1 Combine Hellmann's® or Best Foods® Real Mayonnaise with margarine; spread 1/2 of the Mayonnaise mixture onto bread slices. Top 4 bread slices with cheese, ham and nutmeg, then remaining bread slices, Mayonnaise-side down. Spread remaining Mayonnaise mixture on top and bottom of each sandwich. 2 Cook sandwiches on griddle or in large nonstick skillet over medium heat, turning once, until golden and cheese starts to melt.